Summertime is almost here and I’ve been trying to ban all (ok most) sweets from my diet lately. I can go an entire day without eating dessert but then my sweet tooth always sneaks up on me at night. I like to keep small pieces of dark chocolate on hand for my nightly cravings or for when I’m having a choco-mergency. When it comes to food, I truly believe in moderation and I love to use it as my excuse for when I cheat on fruits, vegetables and protein. I will never ever ever completely deprive myself of things I love– life is too short. I really needed a brownie tonight. Bad. My usual dark chocolate kiss wasn’t going to cut it. 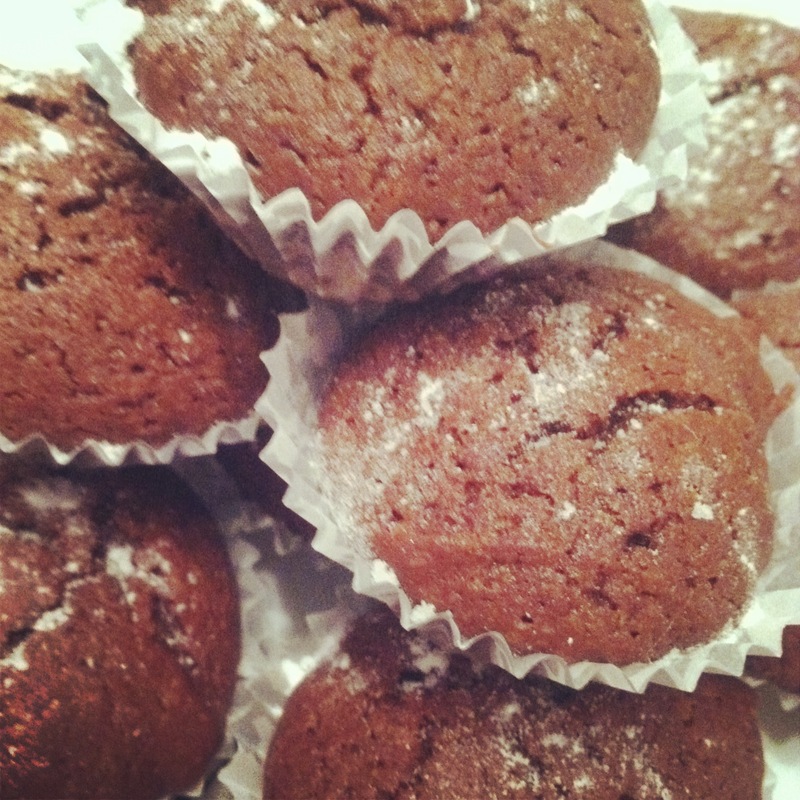 I like to make Bethenny Frankel’s Chocolate Chip Muffins when I’m in need of fudgey goodness, but unfortunately I didn’t have any applesauce or raw sugar on hand. You should definitely try out her recipe though, I’ve been making it for years and it’s the bomb. I’m a big fan of mini desserts. Besides being trendy, they also keep you from eating like twelve servings of dessert or an entire tray of brownies. Another trick for those without will power is to make a large batch of batter and bake enough for just one serving. I usually put the rest of the batter or dough in large ziplock bags and freeze until my next use. It’s also great because your treats will always be warm and fresh! Back to brownies. This recipe is a little lighter than traditional recipes because I used half as much butter, a little less sugar and substituted egg whites. The result is perfectly satisfying, rich and chocolatey. They would probably be even better with a scoop of vanilla frozen yogurt. The best part of this recipe is it’s only 120 calories for two brownie bites—good luck eating only two! Preheat oven to 350. Line mini cupcake pan with liners. Beat egg and egg whites until frothy. Add in sugar slowly and beat with electric mixer on medium until thick and smooth. In separate bowl, mix flour, cocoa powder, salt and baking powder. Gradually add in egg/ sugar mixture and beat until smooth. Add 1 tbs of batter to prepared pan. Bake 14-16 minutes. Dust with powdered sugar and let cool. Those brownies look yummy!!! Will have to give them a try!